Halahan Dunbar was the Church of Ireland Curate in Belleek from 1865 - 1867. While there, he was commissioned by Robert Armstrong to design the Figure of a Greyhound as part of a centrepiece known as the "Group of Greyhounds" that eventually became one of Belleek’s most enduring creations. The Figure of a Greyhound was retired in 1982, but has remained an iconic symbol of Belleek craftsmanship. 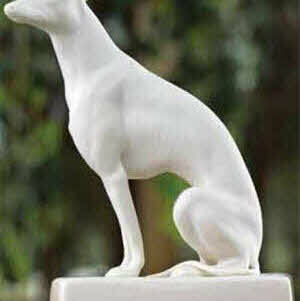 The Belleek greyhound figurine has been re-introduced from the archives in a limited edition of 450 pieces. The fine china greyhound stands 7" tall and is handmade in Belleek, Ireland; the figurine is received gift boxed.